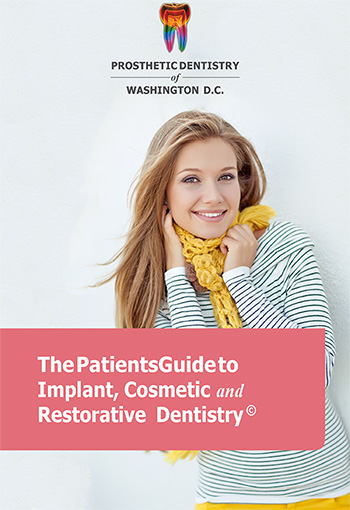 At Prosthetic Dentistry of Washington, D.C. (located in the Washington, D.C.-Bethesda area), the vast majority of our implant patients tell us that they were pleasantly surprised that they only had to take ibuprofen (Advil, Motrin, etc.) after their surgery-and only for a short period of time. Why is that? Dr. Marlin employs a specific drug regimen and a very specific surgical protocol that reduces swelling and tissue trauma. Every case involves the integral use of “guided surgery” by using custom surgical stents when inserting the implants. 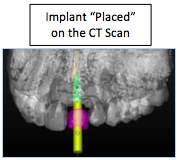 His extensive presurgical planning via a CT Scan (3D image) of your jaw allows Dr. Marlin to precisely plan the angle, depth, and location of each implant prior to the surgery as he is able to “place” them directly on the CT Scan. In many cases, he has the CT Scan software company create the surgical Guide. This precise planning allows him to use a minimal flap design for surgical entry prior to actually placing the implant, which greatly reduces tissue trauma. As a result of our premedication regimen, Dr. Marlin’s planning of the implant precise placement, and the minimal tissue manipulation occuring during the surgery, the majority our patients are impressed with how “easily” the procedure was performed and how little discomfort they experienced after the surgery.